Since I was a kid, church was a part of my Sunday morning routine. That's how it was for many people in the 1960’s. Actually, from the 1940’s until the 1970’s, everyone seemed to belong to a place to express their belief whatever the religious preference, Jewish, Roman Catholic, Presbyterian or other Protestant tribe. Of course, this is not our experience any longer. As we pay attention to our communities and the social trends, we have come to learn that you do not need to belong to express one’s belief. You don't have to join to formally be a part of a group or church to feel like you belong. What's more, you don't have to attend regularly to somehow prove or confirm your connection. Expectations are different now. There are more options and opportunities. 50 years ago high attendance was the norm. But here’s an interesting fact: During the same period, say from 1940 through 1970, the time of peak church attendance in the United States, all other non-profit volunteer associations were on the rise, as well. Think about that. When many churches began experiencing steep declines in attendance, so were the Rotarians, Lions, Optimists, Boy Scouts, and Woman’s Leagues. (Here at Cold Spring Presbyterian Church, our manse and Price Hall was built at that peak time.) Most new church construction and expansion projects occurred then, too. We demonstrate transformational behaviors by listening to the cries of the poor, becoming more of a neighbor-church. Then God's story and God's message will ring out, and our faith in God will become known everywhere (1 Thessalonians 1:7-8). We listen. We serve. We grow. We learn. Let’s do more of that! Churches that transform to establish new community connections become thriving communities of faith! Thank you for all you do that expressed in so many unique and sacrificial ways to show God’s love in worship, giving, mission events, activities, service, and hospitality. Want to understand “church” decline? 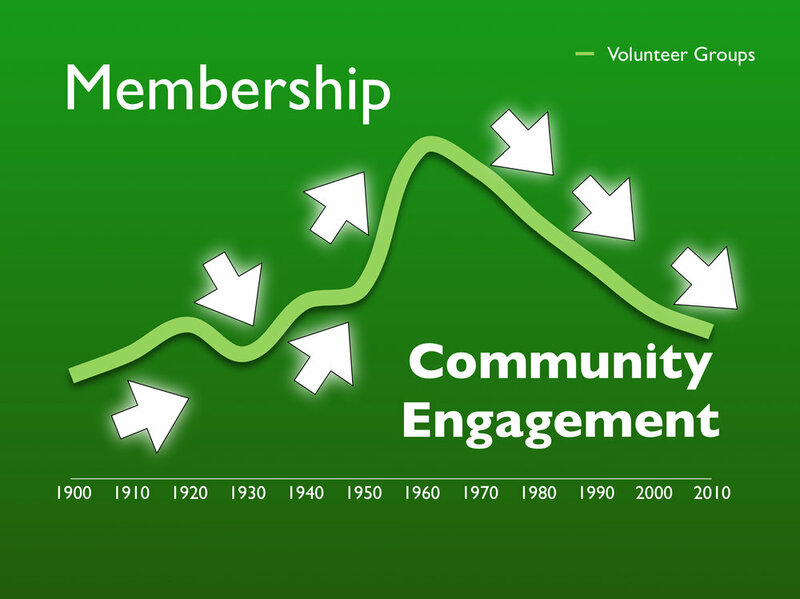 Take a look at the decline in all other volunteer groups! There is a correlation between congregation mission engagement and satisfaction and community engagement. Follow the path. Then, re-engage with your community and reverse the trend line!